Giving Up Nuclear Weapons: It's Rare, But It's Happened : Parallels President Trump is calling on North Korea to relinquish its nuclear arsenal. History suggests that's unlikely. Only one country has built its own nukes, and then given them up. South African President F.W. 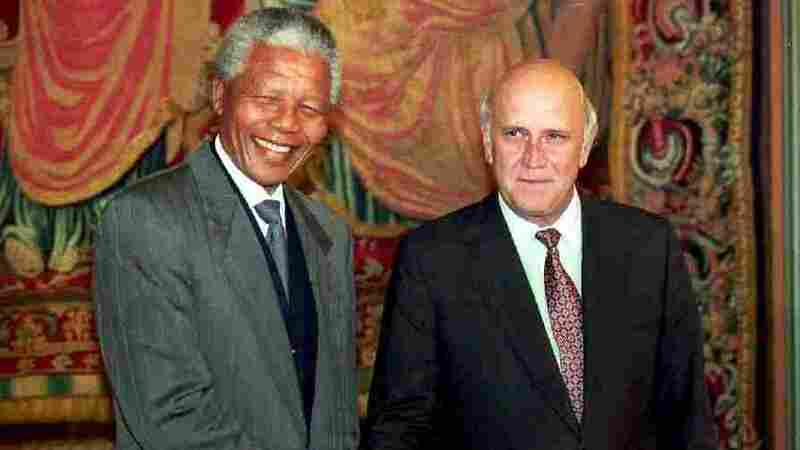 de Klerk and Nelson Mandela jointly received the Nobel Peace Prize in Oslo, Norway, in 1993 for negotiating an end to apartheid. Earlier that year, de Klerk announced that South Africa had dismantled six nuclear weapons, becoming to first country to get rid of nuclear bombs that it had built. "Let us convince the world we are not playing games, that we have broken those bombs down, that we can account for every milli-milli-milligram of material in it — and that is exactly what we did," de Klerk said at a 2012 event in Washington, recalling his decision two decades earlier. To this day, South Africa is the only country that's built its own nuclear weapons and then relinquished them. Three former Soviet republics — Ukraine, Belarus and Kazakhstan — inherited nukes when the Soviet Union broke apart in 1991, and then gave them up. President Trump is now calling for North Korea to relinquish its nuclear arsenal, a step it says it will never take. History shows that countries are unlikely to give up their weapons unless there's a dramatic change in circumstances, as was the case in South Africa. A week after de Klerk's 1993 announcement, his government invited a few reporters, including me, to a nuclear research center where the bombs were built in Pelindaba, outside the capital, Pretoria. We put on protective clothing from head to toe and received a guided tour of the mostly deserted plant, though it still had sealed drums of waste along the walls. One worker said he and his colleagues constantly speculated on the nature of their work, but were never told the details. De Klerk said the weapons were a deterrent never intended for actual use. The white rulers feared the Soviet Union was plotting with local black and communist groups to gain control of South Africa, with an eye on the country's vast gold and mineral wealth. But when the Berlin Wall came down in November 1989, the Cold War was over and the Soviet threat was gone. The following year, de Klerk released Mandela from prison and opened negotiations with his African National Congress. At around the same time, de Klerk decided to scrap the nuclear weapons program. South Africa signed the Nuclear Nonproliferation Treaty in 1991, but did not announce the dismantling of its weapons until two years later. The nuclear weapons became "a millstone around the neck," he said. South Africa's case was unique. With North Korea, neither threats nor diplomacy has worked. But does the South African example hold any lessons? "Absolutely. No country has been compelled to give up its nuclear weapons. But countries have been convinced to do so. South Africa is the classic example," said Joe Cirincione, the head of the Ploughshares Fund, which works to eliminate nuclear weapons. The group has provided financial support to NPR in the past. North Korea displays a mobile rocket launcher in a military parade on April 15 in the capital Pyongyang. The U.S. is calling on North Korea to give up its nuclear weapons, something the country says it will never do. There are no great options when it comes to North Korea, but Cirincione says the U.S. should push for negotiations. "Coercion has failed. Everything we've tried, sanctions, military threats, etc., has only increased North Korea's desire to get the bomb," said Cirincione. South Africa gave up its weapons when the threat went away. Dealing with such fears is sure to be part of the equation no matter how the U.S. addresses North Korea. 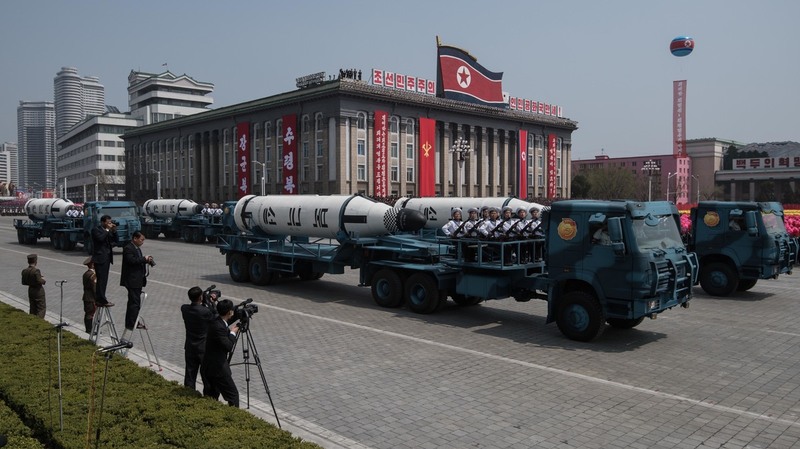 Daryl Kimball, the head of the Arms Control Association, said North Korea fears a U.S. attack that would topple its ruler, Kim Jong Un, and that's what's driving its push for a long-range missile that could threaten the United States. "I think the first order of business for the Trump administration is to find a way to halt further long-range ballistic missile testing and nuclear testing," Kimball said. In any talks, the North would make many demands that could include an end to U.S.-South Korean military exercises, the withdrawal of nearly 30,000 U.S. troops in the South and a formal peace treaty between the two Koreas. But even those deals might not be enough for North Korea to give up its nukes, which it sees as an invaluable deterrent in the face of its larger and more powerful rivals. And South Africa may never be the nuclear example that resonates with North Korea, Kimball said. Ukraine relinquished its arsenal for a promise of security that didn't hold up. Russia seized and annexed Crimea in 2014 and has supported Ukrainian separatists in the eastern part of the country, near the border with Russia. "Ukraine has not felt as though that bargain has been respected by Russia," Kimball said. There's also the cautionary tale of a pair of dictators — Iraq's Saddam Hussein and Libya's Moammar Gadhafi — who gave up their nuclear programs before acquiring a bomb. As Cirincione notes, that didn't save them. "This is exactly, unfortunately, the lesson that Kim Jong Un has learned — that if you give up your weapons, America will kill you," Cirincione said. Saddam was executed by Iraq after the U.S. invaded in 2003, toppling his regime and seizing him. Gadhafi was killed by rebels in 2011, after U.S. air strikes helped the opposition forces oust him. Observers say North Korea's Kim wants a nuclear arsenal so badly because he believes it'll protect him from suffering the same fate.